Rose bushes can develop root rot if not properly planted or cared for and almost always die by the time the gardener has figured out what is wrong. Rose bushes may die suddenly or decline over a number of seasons. Proper planning and care are essential to the health of your rose. Roses experience Armillaria root rot, which is caused by Armillaria mellea, a fungus that lives in soil. This type of root rot regularly affects trees and shrubs, including rose bushes of all types. Initial symptoms occur underground, so gardeners cannot detect them. Rose bush roots change from white to blackish-brown and turn mushy as they rot. The most noted symptom of Armillaria root rot is a white to tan mushroom growth that can develop on the surface of the soil near affected plants. Gardeners might find black shoestring-shaped growths called rhizomorphs. Rhizomorphs look like plant roots on the outside but look different on the inside. Rose plants affected with Armillaria root rot will decline and die over time. Gardeners can attempt to dry out infected plants by removing soil from the root area to expose the root collar, though there is no guarantee that this will work. Gardeners can also attempt to dig up rose bushes and replant them in a container. Severely infected plants should be removed and destroyed. Gardeners cannot plant in the soil without fumigating it to remove the root rot fungus. Prevent root rot in rose bushes by planting them in well-draining soil only. To test the soil, dig a hole 12 inches deep by 12 inches wide. Fill the hole with water once and allow it to drain. When all the water has drained, fill the hole again and allow it to drain again, but time how long it takes. Well-draining soil should lose 1 inch of water per hour. Increase your soil's drainage capacity by adding sand. How often you water rose bushes plays a role in their health, since plants that receive excess water may develop root rot directly as a result of this over watering. 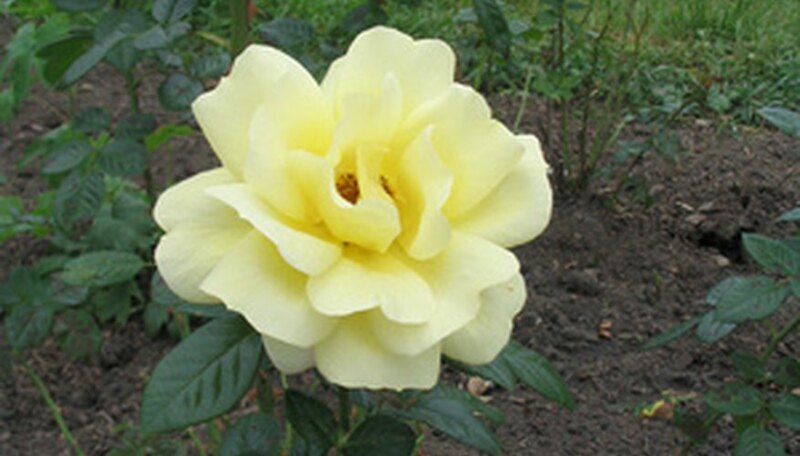 Roses enjoy deep watering and should be watered via hose or drip irrigation until the soil becomes saturated. Then allow the soil to dry out until it's crumbly and dry not only at the surface but several inches below the surface. If the soil feels moist still, hold off on watering until it is dry and crumbly. To test the water content deep in the soil, stick a garden stake down into the soil. If soil crumbs cling to the stake, your soil is still moist and you can hold off on watering. If the stake emerges clean it's time to water. Green Horizons Newsletter: FAQ - What is well-drained soil?